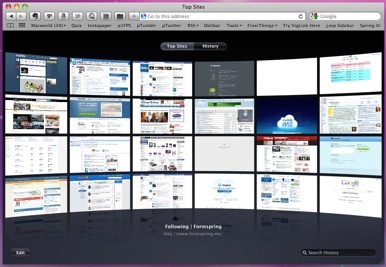 By default, Safari 5 displays Top Sites when you open a new window. You can manually display Top Sites by clicking the grid icon located near the upper left-corner of the Safari window. This grid icon is highlighted by the red circle in the picture below. When the Top Sites grid is being displayed, you can click the Edit button in the lower left corner. Then, in the lower right corner you’ll see that you can switch between Small, Medium and Large. These choices will cause Top Sites to display 24, 12 or 6 thumbnails respectively. You can also drag the thumbnails around in the grid so they appear in the order that you prefer. Additionally, you can click the Push Pin icon or the X icon located in the upper left corner of a thumbnail to permanently add or remove a web site from your top sites. When the Push Pin icon turns blue, you’ve permanently added the web site. When viewing Top Sites, look for a star icon to appear in the upper right corner of a thumbnail. The star indicates that the web site has added content since you last visited the site. Read more about add, bookmarks, customize, organize, productivity, safari, Top Sites.